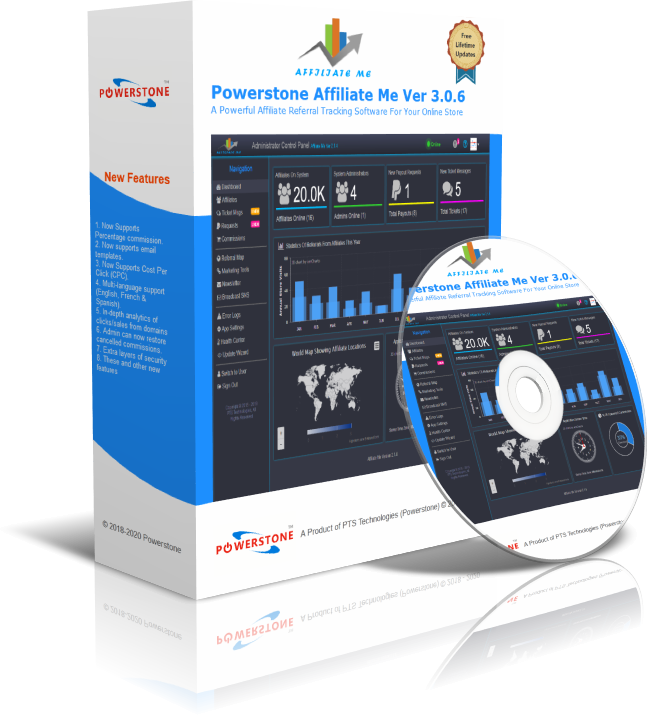 Welcome, Affiliate Me is an affiliate marketing and sales tracking software application written in PHP to help online store owners create their own affiliate network in less than 2 minutes. 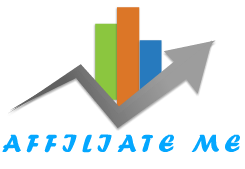 It comes with the capability to help you create ad banners for which your affiliates can put on their website or links that they can share on social media to direct traffic to your site for some commission if the visitor buys from you. It's easy to install and unlike other affiliate tracking apps, Affiliate Me has some smart and advanced features that can put you ahead of your competitors. The installation of Affiliate Me takes less than 2 minutes, the procedure is similar to installing most PHP applications, it comes with an installation wizard and you just fill in the fields and click install. Kindly follow the steps below. STEP1. Uploading Files: Download Affiliate Me zip file from your account to your local hard drive after purchase and extract it using winrar or one of your favourite archiver software and upload the contents of the app folder using your FTP app or in the case of cPanel use the cPanel file manager to upload the contents, remember to put the contents of the app folder into a zip folder before you upload to your server using cPanel file manager. STEP2. Extracting Files: Now that you have successfully uploaded the folder contents of the app in a zip format, you now need to extract it onto your server, after which you can now try to access the folder of the app directly in your browser, if you're using a sub domain then access it directly via the subdomain, eg. https://sub.domain.com and this should load the installer wizard imediately. STEP3. Creating The Database: Now you need to fill in the fields required by the installer wizard, therefore you must create a new database if you already don't have one, if you're using cPanel, then use the MySQL Database Wizard and follow the steps to create your database. Remember to copy down the password you used in creating the database because we're going to need it for the installer wizard and also remember to allow all privilages as seen in the image below. STEP4. 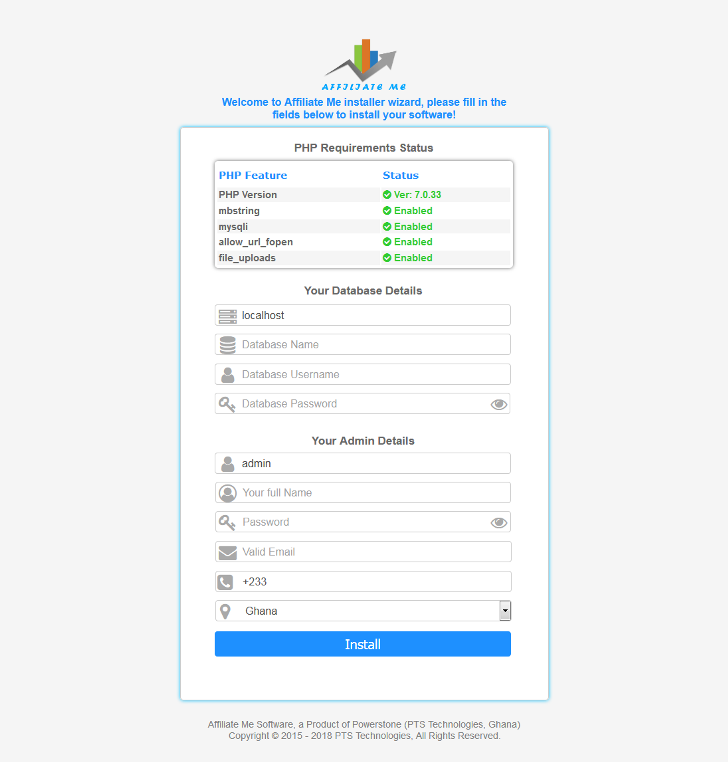 Finalizing The Installation: Okay, now that you have created the database, fill in the fields of the wizard and click "install" Note: confirm the DB host server name from your host, though it is usually localhost, with all details being correct, Affiliate me should now be fully ready for first use. Company Logo: The company logo is the logo of your company which you would like to use to replace the default Affiliate Me logo, this logo should measure 130X90 pixels minimum. App Favicon: The App favicon is the favourites icon which you would like to use on your app, this usually is the same as the company logo but of a smaller size, minimum dimension should be 20X20 pixels. Company/Site Name: This field should contain the name of your company or website, it will be used across the entire website including your outgoing emails. App's Domain/Subdomain: This field should contain the URL on which Affiliate Me is installed, by default Affiliate Me will try to obtain this name during installation but can be wrong in cases where it is located in a folder on the server instead of a subdomain, hence it is your duty to make sure the domain value used here is valid else tracking of sales won't work! TOS Link: This field should contain your company's Terms Of Service URL, it is required to have a TOS if you collect user data on your website, this link will be displayed on the sign up page. In the future updates we'll try to make it a pop up instead of a link. My Site has SSL: Enable this option if Affiliate Me is installed on an SSL domain, ie https://www.yourdomain.com, it is highly recommended to use SSL for Affiliate Me if your online store for which you will be tracking sales is using SSL, else tracking won't work! Currency: This field contains 4 currencies supported by PayPal, you can choose one of the 4 to use for Affiliate Me, remember the chosen currency symbol will be used throughout the app! 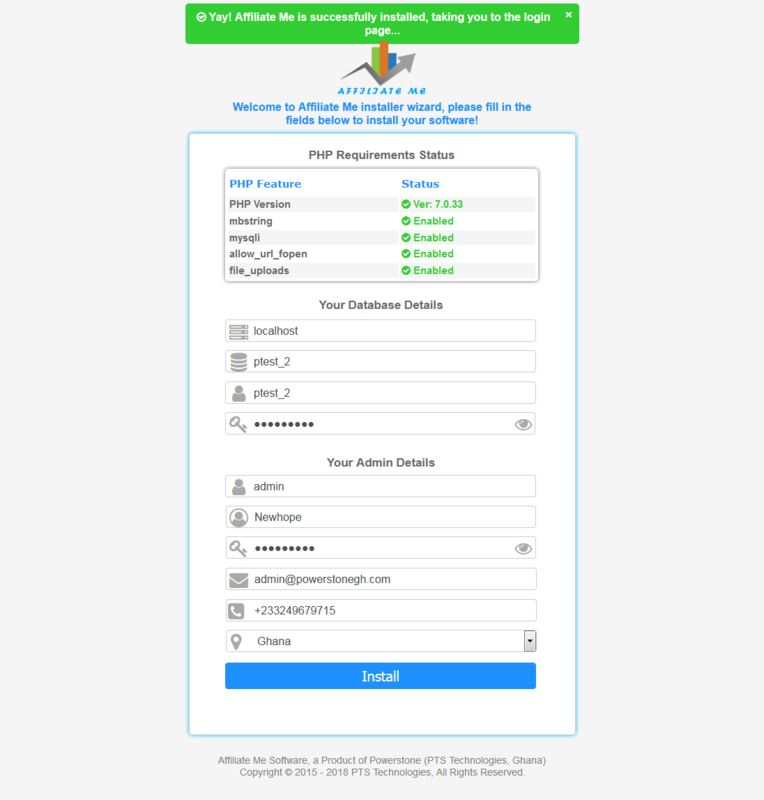 Transaction ID Prefix: This field should contain only 2 letter prefix which you whould like to appear befor the transaction Id's of your affiliate's withdrawal requests. Minimum Cashout Amount: This field should contain the minimum amount that an affiliate can withdraw, only numbers are accepted, no symbols should be entered. Commission Amount: This field should contain the amount that an affiliate earns when his/her affliate link generates a sale, it's a fix amount, future updates will have percentage sales capability. Days to wait before Withdrawing: This field should contain the number of days you would like your affiliate to wait before they can retrieve their commission for withdrawal, please kindly use a reasonable number of days. Your Store URL: This field should contain the domain or URL of the store page to which you want customer's to be redirected to after they click on an affiliate's link. Choose Your Encryption Key: This field should contain an alphanumeric key to encrypt the tracker API which will be used on your store's success page, remember anyone who knows your encryption key can easily generate fake affiliate sale records, hence only disclose this key to people you can trust and change it anytime you think it might have been compromised. NOTE: Always update your tracker API in your store's payment successful page anytime you change your encryption key, else traking will fail and your affiliates can't earn any commission. mNotify Key: This is the API key which you can generate from mNotify website after you sign up for your mNotify account, please note that there are 2 types of API key provided by mNotify, they have the API v2 also, please note that Affiliate Me doesn't use the API v2, it uses only the API key, contact the support of mNotify if you need help generating your key. SMS ID: The SMS ID is the name that will appear on the reciver's phone when you send the SMS, please this name should not exceed 11 characters! Admin's Phone Number: This field should contain the contact number of the administrator and Affiliate Me will notify you by SMS using this contact number, to use more than one phone number, kindly seperate them with a comma(,) and do not forget to start these numbers with your country code if you're not in Ghana. Withdrawal Alert: Enable this option in order to receive SMS alerts whenever any affiliate sends a withdrawal request. Ticket Update Alert: Enable this option if you want to receive SMS alerts whenever any affiliate creates or updates a support ticket. NOTE: You can't enable Withdrawal Alert or Ticket Update Alert if the mNotify Key field is empty! Facebook Profile URL: This field should contain the link to your profile page on facebook. Tip: just visit your page on facebook and copy the URL from your browser's address bar and paste there. Twitter Profile URL: This field should contain the link to your profile page on twitter. Tip: just visit your page on twitter and copy the URL from your browser's address bar and paste there. SMTP Email: By default Affiliate Me is designed to send emails using PHP mail(), however this feature is disabled on some hosting servers hence you're forced to use SMTP, to enable SMTP email you must provide the details of an existing email account of your wish on the server. SMTP Host: This field should contain your SMTP host name, this is usually mail.yourdomain.com, however if you're not sure, kindly contact your host. SMTP Username (Email): The SMTP username is usually an existing email account on your server, eg. email@yourdomain.com. SMTP Password (Email Password): This field should contain the password of the email provided as the SMTP username! Number of Bulk Emails/Hour: Affiliate Me is designed with an inbuilt smart bulk mailing system, which helps you eliminate the use of third party software for bulk mailing purposes, to broadcast and email message to your affiliates, just make sure you enter a value that does not exceed the number of emails allowed per hour by your host into this field and Affiliate Me will use this figure to manage your sent emails, eg. Powerstone allows 100/hour on their server so you just enter a vlue like 99 if you're on our server. Default Email For System: This is the email ID that will be used to send outgoing emails. Note: Affiliate Me always checks new SMTP details before saving them and will alert you if there's an error so you don't dissapoint your affiliates on simple email services like password recovery! Signup Capcha: Enable this option to add a layer of security to your signup form to prevent bots from signing up. Backup Frequency: Choose how often you would like Affiliate Me to remind you to backup your system's database. Google Analytics Code: This filed should contain your google analytics code should you prefer. PHP Requirement Status: This table contains all the system's PHP compatibility requirements and their status as well as the description for the status. Database Backup: This section backs up and also restores your backup of your Affiliate Me database. This page records 404, 403 and 503 errors for future reference, you can delete errors too, other types of errors will be enabled in the future updates. This page contains the form that you can use to write rich text email message and send to your affiliates, remember you can only broadcast messages once per hour and the form will let you know when your next broadcast will be ready. This page contains the form that you can use to broadcast SMS messages to your affiliates, to broadcast to all affiliates just select all users in the phone field and Affiliate Me will populate all contact numbers on the phone fileld, or start typing the username of an affiliate and their numbers will pop up for you to select. This is the page where you update your banners and also copy your tracker API code, to change any banner just upload a new one and it will automatically update it on the system however, the images of the old banners will not be deleted for the sake of the affiliates who are using them. When paying an affiliate you must make sure to click the "return to Merchant" button after payment on PayPal in order for Affiliate Me to be able to update the transaction record of that order. Updating Affiliate Me is very simple, just download the latest version from your account and upload the app contents onto your server, after which you can just extract it and overwrite the old files, then log into your admin account to see if Affiliate Me needs to update it's database, if it does it will automatically run the update and ask you if you would like to backup the new database? After making a choice it will return you to your admin dashboard for the days activity, done! Copyright © 2015-2019 PTS Technologies, All Rights Reserved.